Brahmi-Amla hair oil is a multivitamin for your hair. It has a long standing reputation for promoting luxurious hair growth. As the name suggests this hair oil is made using ayurvedic herbs – ‘Brahmi and Amla’. 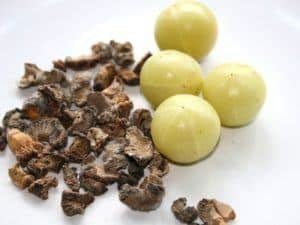 Both these herbs are superb hair tonics – they nourish and condition hair, improve growth, alleviate dandruff, and make hair soft, shiny and beautiful. I have been using this oil for almost two years now and my hair has grown like crazy – it’s amazingly fast growth. My hair is also thicker and denser than it use to be, thanks to the goodness of brahmi and amla. Brahmi is a slender plant that grows commonly in marshy areas of India, Sri Lanka, and Africa. Due to its amazing regenerative and antioxidant properties, brahmi is very nourishing for hair. It helps to slow hair loss, strengthen the hair follicles and improve growth. 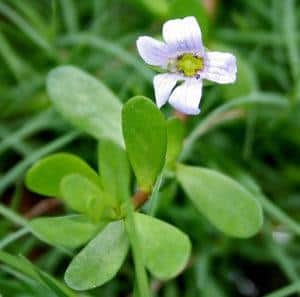 Brahmi is also very calming, so if you have difficulty falling asleep or feeling stressed, brahmi oil can come to your rescue. Brahmi fact: Brahmi is actually an important medicinal herb in ayurveda. It is known for its brain rejuvenating and memory enhancing effects. This herb was said to be used by Vedic scholars to memorize lengthy sacred hymns and scriptures. Any Indian hair oil will be incomplete without the addition of amla. Amla is packed with antioxidants, amino acids, vitamins, minerals, polyphenols and tanins. It acts synergistically with herbs such as brahmi and nourishes the hair follicles to promote healthy hair growth. It’s anti-inflammatory and astringent properties make it beneficial against dandruff and scalp infection. Amla also helps to preserves your natural hair colour, conditions the hair, and increases its texture and thickness. If you have never made hair oil at home you can start with this one. You will learn how easy it is to make your own hair products. Plus, you can be assured of its purity. Like you do in cooking, send in good vibrations and see it nourishing your hair. We are going to use double boiler method to make this oil. Basically, you need a big pan and a narrow bottom bowl or pot that fits over it. Place brahmi powder, amla powder, (hibiscus powder) and sesame oil in the top bowl. You can use stainless steel bowl or glass one – it’s what you like or rather what is available. Fill the bottom pan with 1/3 water and bring the water to a boil. Reduce the flame once the water starts to boil. Place the herb and oil bowl on the top. I infused the oil for about two hours – anywhere from hour and a half to two hours is good time to get all the goodness of the herbs into the oil. (When you are half way just check that you have sufficient water in the pan holding the bowl so it doesn’t go dry). Stir the oil every half an hour or so – I love the aroma that comes out when you stir it. Allow the oil to cool enough to be handled and then strain into a glass bottle or jar. Now add in almond oil, castor oil and essential oils (if using) into the jar. Stir well to combine all the oils and store in a cool dark place away from direct sunlight. Do not forget to label it! Your homemade brahmi-amla hair oil is ready for use. When applying brahmi-amla oil, you can either warm the oil by standing it in hot water for few minutes or use as is. If you are suffering from hair loss, don’t warm the oil. While those of you wanting to condition their hair can warm it a bit – this will enhance penetration. Apply to your scalp and massage gently using your finger pads. After you finish massaging your scalp, run fingers along the length of your hair, paying special attention to the dry areas like the ends. How long you should leave on will depend on how much time you have, but I would suggest at least one hour, and if possible leave it overnight. Make this practice a form of meditation. Just focus on the nourishing process and imagine your hair getting healthier, stronger and shiner. Wash it out with a natural shampoo and let your hair dry naturally to awesome looking hair. The combination that I used for making brahmi-amla oil – sesame/ olive/ castor oil – is best for dry hair and hair growth. Those with fine or oily hair, use a combination of coconut/sweet almond/castor oil. You can also use this blend for hair loss and thinning hair. Feel free to experiment with other oils. Other beneficial oils for your scalp and hair are jojoba, coconut, avocado, wheat germ, evening primrose, and flaxseed. Whichever oils you choose always buy cold pressed ones, as they retain maximum nutrients. Brahmi Amla Hair Growth Complex: Those of you looking for a natural hair growth vitamin, here’s a good one. It contains brahmi leaf, amla fruits, bhringraj leaf, and hibiscus flower extract. Alternatively, you can buy the whole herbs and drink their teas. I really appreciate your clear, complete information. I used your information regarding my henna treatment and I just made this oil. I’d like to try your hair oil. I have a bottle of Brami oil. Can i use that with the others plus powdered Amla? Also, any use in taking the Amla internally? Hi, the brahmi oil will have other herbs added, so I won’t combine more herbs. Can you list the ingredients it has. Amla is beneficial when taken internally, it’s good for skin, hair, eyes and overall health. minaz I am fan of yours natural shampoos, I use reetha, shikai and amla ones. I was really in need of natural oil too. and here I am. I prepared it. just hav few questions. I used powdered form of brahmi , amla as you mentioned. but I found straining it too difficult. how did you do it. as generally such powders are very fine. it is difficult to strain them. About the fragrance , I could only smell oil. I mean that bit crude smell of sesame oil. I was expecting some subtle smell of brahmi . as the powder had little. Can you please help me. I really want to get this right. Hi Richa, Glad to know that you are liking the ree-shi shampoo. You can use muslin cloth or any thin cotton cloth to strain. Brahmi Amla doesnt have that much of a strong smell. You can add a few drops of lavender oil if you wish. I m using ur brahmi amla oil home made(double boiler method) since one month and I have noticed new hair growth and reduced split ends. I made that shampo also,but that reetha was so hard and was so harsh for my eyes so I stopped it and now using Ayur’s shikakai amla shampo. I m very happy with the result. Do you infuse the herbs in sesame oil 2 hours before cooking it or you cook the oil for 2 hours? And can I stick with coconut oil instead of sesame? So what would be ratio for coconut, castor and olive oil? And can I use rosemary, peppermint or lavender EOs? Use coconut oil. Try ratio of 2:2:1 (coconut, olive & castor). You can use the dry herbs. Thanks. And I have thinning and hair loss issue. So, is this the best oil mix? I use the three oils in same ratio. Cause I feel the thickness and healing properties of castor oil helps with reducing the hair fall. As I have noticed that when I use coco:olive:castor in 2:2:1 then I experience more hair fall than usual, maybe it’s an improper analysis. So should I stick with 1:1:1 or try 2:2:1? And how many drops of EOs for hairfall/thinning? Hello my name is Stephanie King El l am deaf. I am in bald . don,T work growth up nrever never never life. I am sad want help me okay. Thank you. Yes it is true that amla is very good for the hair. Thanks for posting so many useful tips. I have thin hair and hair loss, what amount of sunflower/sweet almond/castor/coconut oil should be added for Brahmi and Amla powders ? sorry I found the answer above..my mistake…. Thank you! I actually just ordered these two powders yesterday for use with henna hair masks, so this will make a great addition to that! Great post. How can I make this using whole dried amla? Thanks Sarah, yes you can use whole dried amla, but the only thing is that the oil will not turn out dark.